The EBS FuzzMo pedal is developed by EBS to fill the gap between EBS excellent distortion pedals and a vintage type of fuzz effect for bass. The pedal produces a wide range of vintage and modern effects with several features to dial-in Your favorite fuzz tone. Similar to the Billy Sheehan Signature Drive, you can blend the fuzz tone with a clean signal. Fire up the distortion engine gain as much as you like with the ’Gain’ control, set the ’Volume’ for the distortion and then blend in the clean unaffected tone by turning up the ’Blend’ control. Instead of a tone control, the EBS FuzzMo features a ’Shape’ control that changes the shape of the gain engine, from triangle to square wave through the passive tone stack. If the controls does not offer enough flexibility, this pedal also feature a ’Character’ filter. This goes in three steps from flat, to subtle mid-scoop, to maximum mid-scoop (or cut). The EBS FuzzMo uses a True Bypass foot-switch. The pedal runs on 9V DC battery or Power Supply. 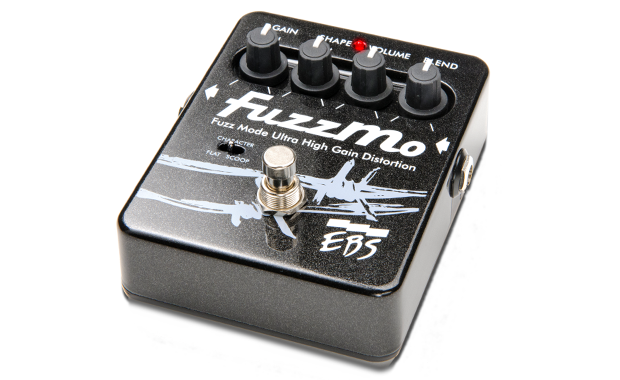 The EBS FuzzMo is shipping now! 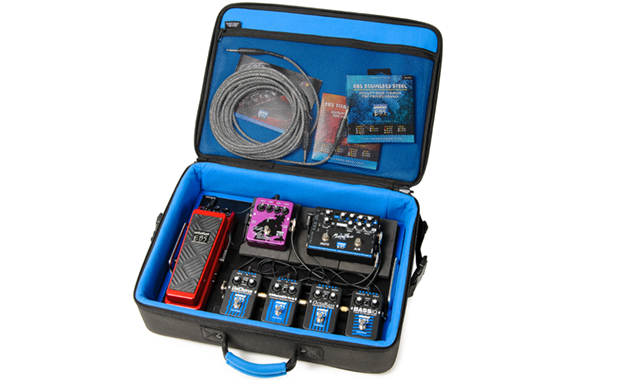 The EBS CarryOn™ heavy-duty pedal board with soft padded case is tailored to fit as cabin luggage. The endless possibilities due to the featured items make this pedal board one of the most versatile on the market. Several features add to the comfort when carrying around the case, such as the extra padded handles and shoulder strap. The included code lock makes it easy to keep your pedals safe while traveling or at the rehearsal space. The pedal board handles can be placed either on each short side or on the top long side of the board. Featured angled rubber pads can be used to set an angle on the complete pedal board, or to angle single pedals or a row of pedals. The pedal board is 2-sided where one side is prepared for using the featured velcro pads to attach pedals, and the other is suitable to use the featured 3M™ dual lock. Possibility to set complete pedal board/or selected pedals in different angles using the included angled attachable rubber pads. Attached by screws or with adhesive tape. © EBS Sweden AB 2013 | EBS SWEDEN AB is an AAA-certified company in accordance with Soliditet’s credit-evaluation system. This entry was posted in EBS Sweden AB - Press Center and tagged bass, carryon, EBS, effects, fuzzmo, guitar, pedal board on October 10, 2013 by ebssweden.